The market is flooded with cheap mobile charger circuit. Some of you may be looking for this type of charger circuit diagram and components list. These mobile chargers uses only few parts, very simple design. But there’s a drawback too, they got damaged easily. Some of my friends keeps asking how to repair mobile charger circuit, so I’ve decided to do a little reverse engineering of those chargers. First of all, lets have a look at the charger’s circuit diagram. As transformer is a bit odd, so I’ve also decided to draw it by hands. Unfortunately every charger circuit is not same, some of them contains few extra capacitors or resistors. But even though, you can get a clear overview of the mobile charger circuit from the above diagram. The design is quite straight forward, built on a paper phenolic PCB, could be easily repaired. Finally the part list, you can replace most of them by their closest alternative. As I’ve said before, this type of 13001 transistor charger circuit may vary in design and part number. But the basic circuit is same, few of them have a little LED as indicator. Primary: Around 250 turns of 36 to 40 SWG enamelled copper wire. Secondary: 6 turns of 26 to 28 SWG enamelled copper wire. Auxiliary feedback: 8 to 15 turns of 36 to 40 SWG copper wire. 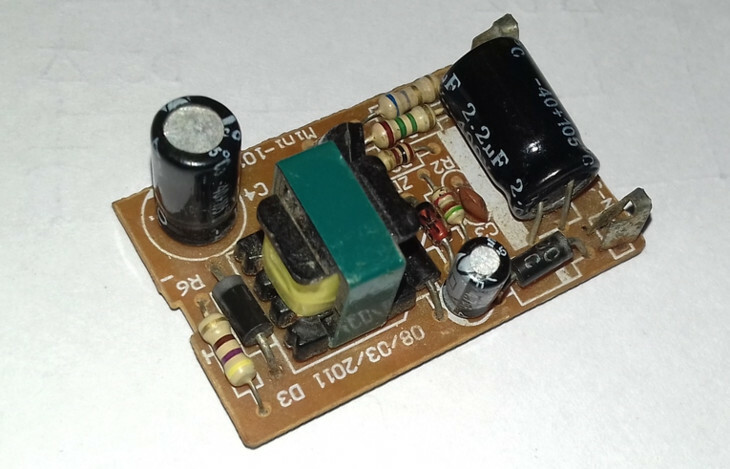 If the transformer is broken, you can use the transformer from other broken charger of similar type. Let’s discus about how this circuit works, first have a look at the picture below. The first stage is a half wave rectifier, made with D1, R1 and C1. It rectifies and filters the AC input to high voltage DC. So, the voltage between point A and poing B is approximately 170 volt for 120V AC input and 311 volt for 220 volt AC input. The Second step is a self oscillating(ringing choke converter, RCC) flyback oscillator, consisted of all the parts shown inside the red box and the primary+auxiliary winding of the transformer. So how the flyback oscillator oscillates? When the AC power is connected, base of the transistor starts opening as it’s biased by the Resistor R2. The current through primary winding starts rising rapidly, and reaches to the threshold level within no time. But at the same time, an opposite(but low) voltage starts rising across the auxiliary winding of the transformer. This opposite voltage starts charging the capacitor C3 negatively, much faster than charging it through R2, thus ultimately blocks current flow through primary winding. As there’s no more current flow in the auxilary winding, C3 starts discharging through R3 and the current through R2 again starts opening the base of transistor Q1. This process repeats itself again and again very fast. May be around 10,000 to 50,000 times a second, depending on various parameters. So ultimately we got the circuit oscillating. As the circuit is oscillating, the energy stored in the primary winding is dumped in the secondary winding as well, when the transistor is in off state. The Rectifier 2 stage is responsible for rectifying and filtering the induced current and voltage on the secondary. The rectified and smoothed voltage apears between poing C and D. Which could be as high as 8-9 volt under no load. But very quickly drops when a load is connected. The resistance R4 ensures a little current flow, thus prevents the capacitor from being over charged. As there’s no feedback mechanism between low voltage side and the oscillator, the voltage drops between point C and D when a load is connected. Well, that’s certainly not the easiest explanation, but I think simple enough to understand what’s happening inside the mobile charger circuit. If you have any question or suggestion, please feel free to ask through the comments. If I want to 12volt out put in same circuit, then what I do? I have assembled above circuit and tested but I am not getting proper output I getting output only 1.66v. what is the reason behind it even I have check the assembled circuit still not what will be reason. Can you please explain this in deep. Like how resistancevalues are calculted and how turns ratio is calculated for this circuit and orher mobile charger circuit …and why non polarized capacitor is used etc etc..
Can I ask what specific transformer was useda in this project??? Very informative.thanks.but i want to know wattages of primary,oscillator circuit and secondary circuit and how it is calculated.general formula is wattage=voltage×current.please reply. You have not shown the phasing of the ouput winding or described use of D2, D3 and C2. I think they make up a crude voltage feedback network. The dot should be on the bottom of the secondary under these conditions. D3 rectifies this voltage and if +ve output increases on the output, a more -ve voltage is generated across C2 which in turn reduces drive to Q1 through D2. I would also like added a comment that working directly with mains voltages is very dangerous and the transformer particularly could suffer insulation breakdown in use possibly putting mains voltages on the output whilst in use. what specific transformer was used in this project?